Whole Dungeness crab purchased from a grocery store or fish market is often boiled before it is sold. However, to reheat the crab meat without drying it out, steaming the crab for a short period is the best method. 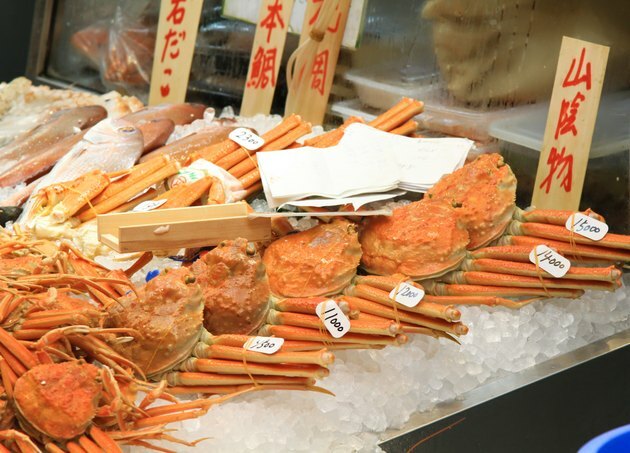 Make sure your crab has been cooked, especially if you are buying whole Dungeness crab from a busy fish market, as raw crab will need to be steamed for longer. Add the white wine and water to a large stockpot. Place the steamer basket in the top of the stockpot and heat the liquid over high heat until boiling with the top on the pot. Place the cooked Dungeness crab in the top of the steamer and reduce the heat to medium. Heat the Dungeness crab in the stockpot for three minutes over medium heat. Remove the steamed Dungeness crab from the steamer basket with a pair of heavy tongs. Transfer the Dungeness crab to a warm serving plate and serve immediately while warm. Serve the Dungeness crab with freshly sliced lemon wedges and melted or drawn butter for a classic presentation. For a bit of extra color, add fresh flat-leaf parsley to the butter or on top of the cooked crab before serving it. Add freshly chopped tarragon to the steaming liquid for extra flavor. Be careful when removing the Dungeness crab from the steamer basket, as the steam may burn you if you are not careful. Wear heavy oven gloves and use tongs with a long reach. How Many Calories Are in Dungeness Crab?